1. To some degree your recent work [or activities] has involved the participation of an [un] specified public, of which I’d like to open the opportunity to you to select and recount the experiences of those particular works. I felt privileged that my collaboration with the Pestalozzi students blossomed into three separate art pieces. “The Knowledge – ‘Land of Achievement’ ‘Land of Happiness’ and ‘Land of Wisdom’ ” was the key piece I initially submitted to bridge the geographical and mental gap between Hastings people and the Pestalozzi scholars. Based on the Proust Questionnaire, I used replies to the questions “What is your greatest achievement?”, “What is your idea of perfect happiness?” and “What is your most important life lesson?” to create maps, anecdotal maps [a concept I had already developed in a London-based project]. 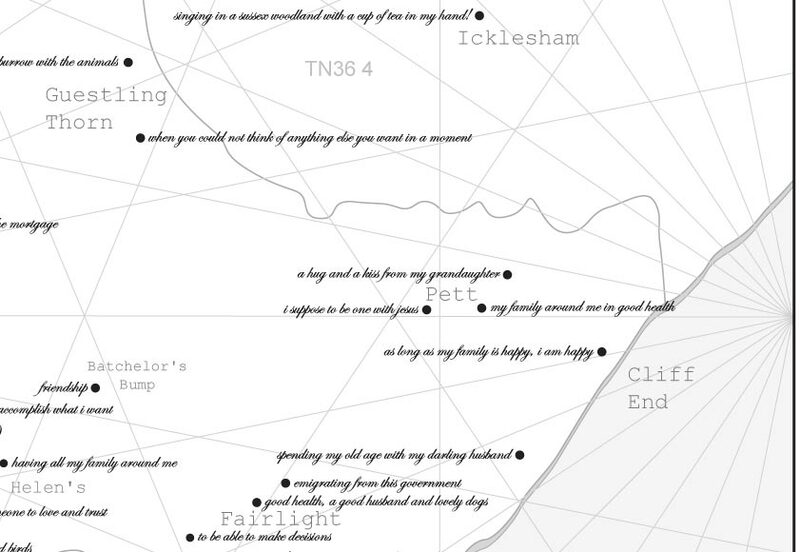 By asking everyone the same positive questions and then plotting them on redrawn maps of Hastings and its surroundings, my aim is to challenge stereotypes. These anecdotal maps offer a view of Hastings as a rich and varied polyvocal tapestry, revealing glimpses of individual’s lives and aspirations. Instead of focusing on the landmarks, I am interested in the people who create their ‘neighborough’. I play with the notion of census and address the reputation of certain areas. My artworks tell stories and aim to create bonds between people who might not at first identify with each other through their social, cultural and racial backgrounds. I was also interested in presenting the public and private facets of the students. A photographic series was a platform to demystify as well as reconstruct the image of students as “Ambassadors” for the Trust. The premise of this artwork is based on the Pestalozzi’s philosophy to educate ‘the Head, the Heart and the Hands’. This holistic principle of educating the whole person inspired the format of this portraiture piece, codifying their personal interests. The students are aware of the responsibility bestowed upon them as they were chosen for this prestigious scholarship. I asked them to choose and re-enact the poses found in a Gestuno book, which is the sign language equivalent of Esperanto. The parallel between the idealism of a universal language and that of an institution with an all-embracing message of tolerance and peace enriches the subtext of this piece. Pestalozzi scholarships are awarded to exceptionally bright but extremely poor young people aged 16-20 from developing countries in Africa and Asia, who have no hope of anything other than a basic education. They have to show a real commitment to changing the future of their own countries. A curriculum combining academic education with practical and community work fulfils the Pestalozzi philosophy of educating the ‘Head, Heart and Hands’ and gives them a wide range of skills to take back to their countries. The last piece, entitled “Diary of Days and Nights”, incorporates the symbolic representation of their everyday anecdotes and the visual recording of their dreams. I wanted to show les coulisses, beyond the façade of the institution, beyond the mask of their public selves and the smiles at photo opportunities. These scholars might be the ‘chosen few’ but are still teenagers. This was a fantastic opportunity for them to raise their self-awareness, to translate their role in society at this crucial time of their lives. The mythisation of the journey from mundanity to greatness was codified in a collage of symbols, with an emphasis on patterns and repetitions. 2. How did working in a location specific context with a group/organisation who voiced an interest in working with you, affect your approach to working with those participants? Where there any challenges, if so, how were they resolved? My art practice is about subverting categorisation and questioning notions of identity. There certainly was a connection in terms of the altruist philosophy of the Trust and my interest with cultural, linguistic and racial métissages. Also the maps exemplify a democratic space, locating voices rarely recorded. As the identity of the participants remains anonymous, contributions are open to interpretation, stimulating the imagination of the audience. That is an integral part of the project. The anonymity element allows the contributors to be true to themselves at the source. Plus, it stops the audience from making judgment based on gender, race and creed downstream. This subjective truth is rarely broadcasted beyond circles of family, work colleagues and friends, or the curtains of shifting communities. 3. How did conversations and the experience inform the conceptualisation of the final work[s]? During the workshops, the students explored the visual aids and mechanisms used in interpreting social and political aspects of their everyday life, and so composed a language of personalised gestures and symbols. They acted as the ‘Ambassadors’, creating bridges in collating contributions for the maps from friends at college, strangers on the bus, people they met on the street. We did an exercise early on using drawing. I asked the students to draw themselves first and then to draw someone else in the group. It was fascinating to witness beyond the mastery of draftsmanship, the reactions to the perception of others upon one. The tension between the self-image and the one filtered through the prism of another person’s vision within the inner circle and the outside world is at the core of all these pieces. As part of their curriculum, the students interact with school children in the area. Some students related how they were bemused and saddened by the way some Hastings children interpreted and have digested over the years the negative images of the developing world. So in some ways, ‘The Knowledge’ maps, the ‘Ambassadors’ photographs and the ‘Diary of Days and Nights’ scores, make the students more accessible to other local community members. I want to thank Musakanyakombe, Musavengana, Thandiwe, Saba, Tashi, Tash, Suniti and Lachana who have been fantastic to work with as well as Andrew and the great bunch of volunteers and staff who have made this collaboration a very enriching experience. 4. In your opinion, is the final work a summation or catalyser for further discussion between HMAG and the organisation/group? The maps act as visual vox pox. They are historical records of a sampled group and their life vision. The art of mapmaking has traditionally been about recording the land and ownership of the land. It is a tool of power. My gift to all the participants is to record the wealth of experiences that makes them who they are, by sharing a glimpse of their achievement, aspiration and words of wisdom in a piece of art. Their gift to me is to champion the project and trust me. Ultimately, it is about one’s legacy, one’s personal life and geography. I wanted people to feel good about themselves, to be aware of the filters of their answers and record it on paper. The point of entry of the project is the Questionnaire. It acts in a Proustian sense, as a catalyst for the participants to remember the day they sent me their entry at the very moment they will face the maps in the gallery space, just like the taste of the madeleine triggered Proust on his journey “In Search of Lost Time”. The maps are just under 1m square each so it is a very physical experience of finding where one fits on the map but also being aware of others living and working within the parameters of Hastings. People usually go from one map to the next so the entries acts as three parts of one sentence. All respondents will be invited to the private view to meet, discuss, engage with one another. My objective is to make conceptual art more accessible, to help people see past their preconceptions and foster a more central community spirit based on shared understanding. 5. What’s the actual or imagined legacy of that project? From a practitioner’s point of view, do you think its possible to advise how HMAG could continue nurturing the relationship? The most potent legacy is an awareness of the differences and similarities between two worlds. The cocoon of Pestalozzi and the reality of Hastings. The common denominator is the tentative dialogue that the maps encapsulate through the juxtaposition of answers. The achievements of these anonymous Hastings individuals stretch from passing exams, having children, donating bone marrow, overcoming mental illness to reaching the Everest base camp. Quite a few Pestalozzi students chose gaining the scholarship, others mentioned academic brilliance and demonstration of their altruism. The vision behind the work is to communicate a universal message of shared wisdom and personal development that transcends barriers or race, gender, class and age. Ultimately the individuals are the lungs of the town, it is their idiosyncratic difference that breathes life into its streets, and that should be celebrated. ‘Placing art at the Royal Geographical Society (with IBG)’: Art and the production of geographical knowledge.